The family of a woman who died following a road traffic collision on the A66 have paid tribute to her life. Cumbria Police have named the woman who died in a crash on the A66, as 76-year-old Ann Copley. Mrs Copley, from Montgomery Court in Carlisle, was the driver of a Citroen C3 that was involved in a collision with a white Renault Master. The crash happened around 12pm on Tuesday 14 August near to the Llama Karma Kafe, just outside Penrith. The driver of the Renault Master, a 76-year-old man from Ipswich, was airlifted to James Cook Hospital in Middlesbrough with serious injuries. His condition is described as stable. Anyone with any information is to call 101. A 76-year-old woman from Carlisle has died following a crash on the A66 near to the Llama Karma Kafe, just outside Penrith. The crash happened around 12pm on Tuesday 14 August and involved a white Renault Master and a silver Citroen C3. The driver of the Renault Master was a 76-year-old man from Ipswich. He was airlifted to hospital with serious injuries. His condition is described as stable. The road was closed for several hours and has since reopened. Police are appealing for anyone who may have witnessed the collision or have dashcam footage. A man has been taken to hospital following a crash on the A66 near Stainburn. The crash happened just after 8am on Sunday 12 August. Police said the man, who is local and in his sixties, was freed from his car by firefighters and was taken to hospital with non-life-threatening injuries. His car was the only vehicle involved. Police are appealing for witnesses following a serious road crash on the A66 near Threlkeld. It happened at around 6am on 30 May. A Suzuki Swift and DAF flatbed HGV collided causing serious injury to the male front seat passenger in the Suzuki. A 21-year-old passenger, from Penrith, was taken to Cumberland Infirmary Hospital at Carlisle before being transferred to the Royal Victoria Hospital in Newcastle. His condition is described as serious. The drivers from both vehicles escaped with minor injuries. Emergency services were at the scene. The road was closed for six hours. Anyone with information are asked to call 101. A lorry driver accused of causing a fellow motorist's death by dangerous driving on the A66 in Cumbria will go on trial later this year. 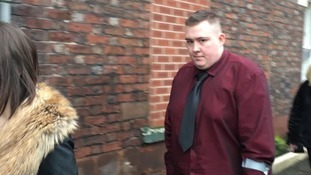 Carlisle Crown Court heard how "impatient" Chey Clark pulled out from a busy line of traffic in darkness and above the speed limit. The A66 has reopened both ways following its closure due to a road traffic accident involving a tanker and a car between A595 Main Road (Chapel Brow Roundabout) and A595 (The Fitz Roundabout). Traffic has returned to normal and the accident has now been removed from the road. The A66 has reopened following an earlier crash involving a cyclist and a Toyota Avensis. The collision happened shortly before 2 o'clock this afternoon. The driver of the car, a 43-year-old man from Threlkeld, was not injured. The cyclist, a 60-year-old man from Florida, received serious injuries and was taken to Newcastle hospital via Air Ambulance. The road was closed for a time while the emergency services attended the incident. A 60-year-old man from Florida has been taken to hospital in Newcastle with "serious injuries", after his bike collided with a car on the A66. The accident happened at Threlkeld, near Keswick. The driver of the car was uninjured in the accident. Motorists are asked to follow the diversions in place.